With this basic beginner's field guide to North American wildflowers, all who enjoy nature and the outdoors can identify common wildflowers, from backyard weeds to dainty forest blossoms. 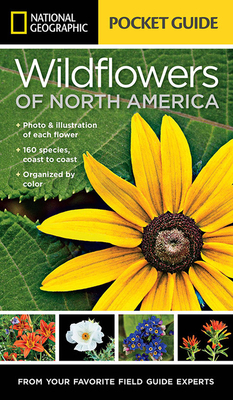 In a logical, user-friendly, highly visual format, this new title offers key facts about 160 of the most common wildflowers and weeds, coast to coast, including Canada and Alaska. To help with identification, each of the 160 entries has both a color photograph showing the plant in context and a color illustration showing the blossom close-up. This book is the perfect starting point for anyone, young or old, interested in learning how to identify wildflowers. Author CATHERINE HERBERT HOWELL has been writing and editing natural history books and field guides for more than 20 years. She volunteers as a certified Master Naturalist for the Arlington Regional Master Naturalists, providing nature-related programs and activities for children and adults and is a founding member of the Arlington chapter of the Children and Nature Network. She is the author of National Geographic's Flora Mirabilis. Illustrator FERNANDO G. BAPTISTA graduated in Fine Arts from País Vasco in Spain. He worked as a graphic artist and museum exhibit creator, taught infographics at the University of Navarra, and now works as an illustrator for National Geographic magazine. Baptista has won more than 125 international awards and was named one of the five most influential infographic artists of the last 20 years. Illustrator JENNY WANG was trained in medical and biological illustration at the Johns Hopkins School of Medicine in Baltimore, Maryland. Her areas of focus include scientific illustration, biomedical visualization, and information design.